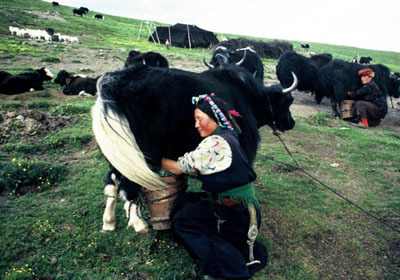 Tibet's Drokpa, or nomads, have been herding livestock on the vast high-altitude pastures of the Tibetan Plateau for millennia. 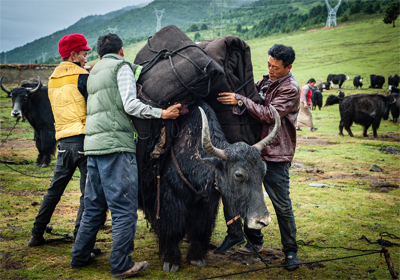 Traditionally, Tibetan nomads were very free, but recently, a lack of appreciation for and understanding of the indigenous knowledge of the Drokpa has resulted in the rapid erosion of this ancient way of life. This essay explores the lives of four Drokpa communities holding the thread of tradition in the midst of modernization and imposing development. Click on the image above to read the full story on the EMERGENCE website. Tibet is well known as "a land of snows," having the youngest and therefore some of the highest mountains on Earth. I found a landscape of awesome beauty, with an average altitude of 14,000 feet and an extreme, savage climate. It struck me that it takes a tough and resilient people to flourish in these conditions. Perhaps the vastness and solitude of the landscape have been a source of inspiration for the Tibetans, helping to encourage their natural bent to visionary mysticism and to develop their unique brand of Buddhism. Click on the image above to read the full story on the MOOWON website. Click on the image above to read the full story on the Global Oneness Project website. 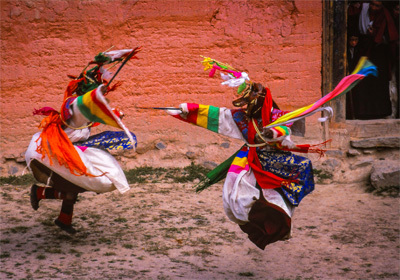 Tibet is a sacred land, its people an expression of that sacredness. 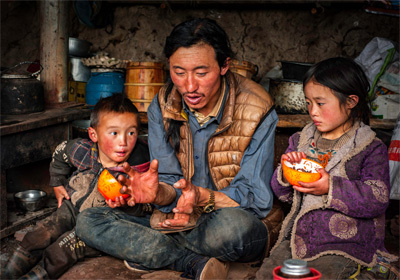 For 17,000 years before Buddhism arrived the nomads and farmers of Tibet practiced Bon Shamanism which revered the land and related to it as a spiritual being. The sky, mountains, rivers and lakes were animated by gods, demons or nature spirits. The establishment of Buddhism in Tibet in the 7th century transformed the country and created a culture of tremendous depth and richness. Today, shamanic practices continue to coexist alongside studious monasticism and a lived compassion for all beings. In the West, dragons are the stuff of myth, legend and wonderful children's stories. But to Tibetan nomads, or "drokpa", dragons are real and seeing them is always an auspicious sign. While travelling in eastern Tibet I visited Sonam Wangbo and his family, nomads who live in the remote, beautiful and sacred Dahu Valley. 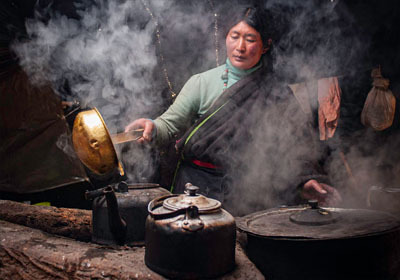 We travelled on horseback to his spring home high in flower-filled pastures and, settled in front of his stove with the Tibetan staple, a bowl of tsampa, I found myself asking him if he had ever seen a dragon. 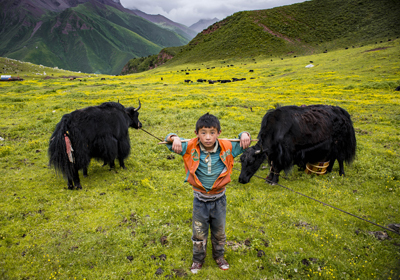 The Tibetan nomad's understanding of the sacred landscape brings reverence, care, and respect to the land, which is the basis of the conservation and environmental protection that the earth so badly needs today. Click on the image above to read the full story on the KOSMOS website.